Even though and actually the wine is much better than I expected and indeed is refreshing, young and still more sour than a usual Sauvignon Blanc. There comes certain bitterness along with a sour fruitiness which could be citron and – indeed grapefruit – as well. This bitterness which is not smoky or even oaky is really special. The wine has a nice light green color, the first nose is pertly and blithe. Ironically I had this wine together with asparagus, ham and potatoes which fit to each other well. Wernersbach is the surname of two winemaking brothers Florian and Stephan. Their vineyards are at a village called Dittelsheim-Hessloch at Rheinhessen which is German’s largest wine area. Due to Germans federal history Rheinhessen does not belong to the German Bundesland Hessen but to Rheinland Pfalz. Both brother belong to a new generation of young winemakers in the region who produce usually rather Riesling but also Pinot Grigio. A little bit similar to A.J. Adam (https://avdwineandfood.wordpress.com/2015/05/07/a-j-adam-hofberg-2013/) the parents of the brothers produced wine in sideline, now it is the main business. The webpage isn’t yet finished: http://www.wernersbach-weine.de/ but you will find a lot of addresses in the internet where you can buy these interesting and very fair prices wines. 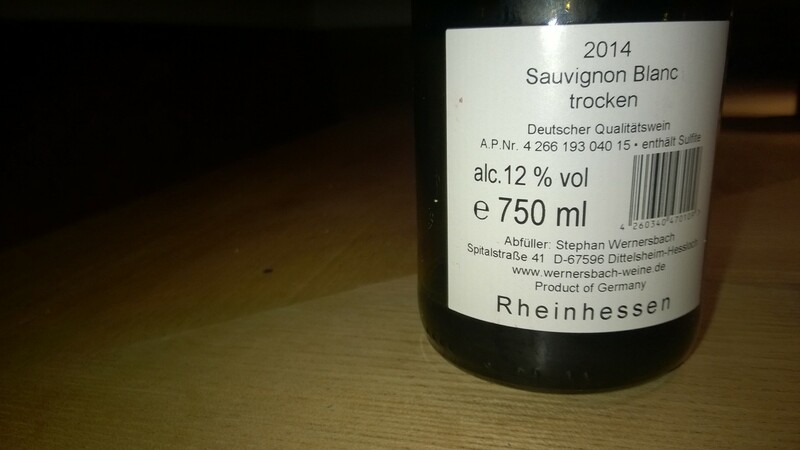 Please also see the review of another wine which comes just 13 kilometers away from Dittelsheim-Hessloch: https://avdwineandfood.wordpress.com/2015/06/27/pinot-noir-unfiltered-peth-wetz-2012peth/ – a unfiltered Pinot Noir from Bermersheim.